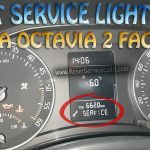 How to reset service light indicator Skoda Yeti. Displaying the distance and days until the next service maintenance. You can use the button 3 to display the remaining distance and days until the next service maintenance, see above picture. A key symbol and the remaining distance appear for 10 seconds in the display. At the same time, the remaining days until the next service maintenance are displayed. On cars which are equipped with the information display, you can call up this display in the menu Settings, see info below. Service in … km or… days. Resetting Service Interval Display Skoda Yeti. Reset the service interval display by using the reset button 7, see above picture. On vehicles which are equipped with the information display, you can reset the Service Interval Display in the menu Settings, see info below. We recommend that you do not reset the Service Interval Display yourself as this can result in the incorrect setting of the Service Interval Display, which can also cause possible problems with the operation of your vehicle. Operating with the buttons on the windshield wiper lever. You can activate the Main menu by pressing the rocker switch C for more than 1 second. The individual menus can be selected by pressing the adjustment wheel D.
The selected menu is displayed after briefly pressing the adjustment wheel D.
If warning messages are shown in the information display, these messages must be confirmed with the button B on the windshield wiper lever or with the button D on the multifunction steering wheel to call up the main menu. If the information display is not activated at that moment, the menu always shifts to one of the higher levels after approx. 10 seconds. The operation of the factory-fitted radio or navigation system is described in separate operating instructions to be found in the on-board literature. That it is the full procedure how to reset service light indicator Skoda Yeti. If you like to reset any maintenance oil light after an oil change. Or reset check engine light, airbag light, inspection key or insp errors when maint reqd, for Skoda cars. Or any warning light for service reminder which appears on the display. Write in the search box the car name for which you want to find information, and find how to reset other service reminders by yourself.